Two concerts this week from Jazz Night School ensembles! Thursday June 9: Big Bands and Vocalists and Saturday June 11: Small Ensembles and Vocalists. Only $10 admission and kids are free. Shows start at 7pm. Join us for good music from people having fun, learning jazz. If you haven't made it out yet, come see what all the fun is about — and if you've come before, you know to come for more. 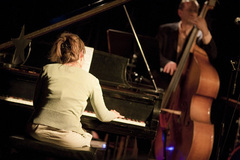 The neighborhood's own Jazz Night School proudly presents student performances at the end of each ten week session. Performances are great experiences, great motivation — and fun. Come hear what people have been learning. All ages welcome. Plenty of seats — bring the kids. Free Jazz Night School stickers too. Big Bands! A fun night! Big aisles for dancing! Big Band II — debut performance. Come hear the great work they've done with swing standards Pennsylvania 6500, String of Pearls, and more. 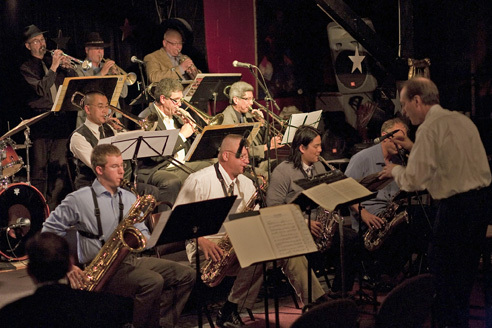 Performance Big Band — featuring new music and guest vocals from Kathi Randall and Lee Ingalls. The band is revving up for the summer's performances and getting stronger all the time.